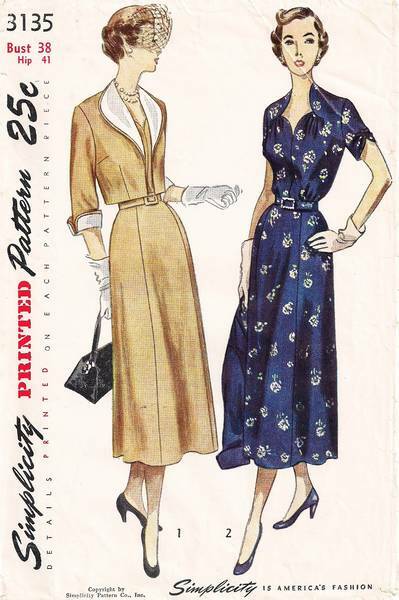 Vintage Simplicity sewing pattern 3135. 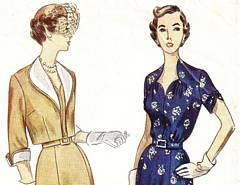 Dress with shaped neckline formed by gathers at the sides. The short sleeves are also gathered at the sides. Six gore flared skirt. Self or purchased belt. Bolero jacket has wide collar cut-in-one with front sections and 3/4 length sleeves. Detachable collar and cuffs. Bust 38; Waist 32; Hip 41.